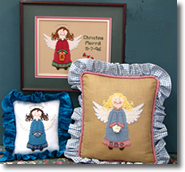 Cross Stitch and Needlework designs by Cindy and David are created with the stitcher in mind - the cross-stitch patterns are easy to read and fun to stitch. 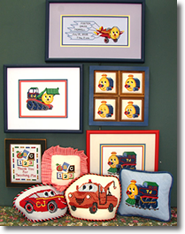 Buttons, beads and other finishing touches are used, as well as specialty fibers, crossstitch fabrics and stitches. All Stacked Up Series:Whimsical birds juggling seasonal items. Easter Chick with eggs, Bluebird with kites, Turkey with pumpkins, Owl with books, Eagle with stars and Flamingo with beach balls. 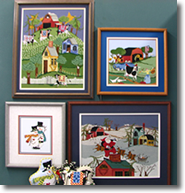 Folk Art Designs: A series of adaptations of Wilson & Wilson’s original Folk Art paintings. – whimsical cows with quilts on their backs, summer meadows and cats everywhere! You will love the depth, folksy designs and solid stitching. Heart Strings Series: Each design has 3 hearts with different designs for the same seasonal theme. We have all 12 months completed and a design with 12 hearts in a heart shaped pattern. These are adorable finished as a box, easel back or framed and these seasonal charts will definitely pull at your heartstrings! We stitched these on 18 ct. linen and 10 ct. Tula using all sorts of fun specialty fibers and buttons. Fun and fast so you can change your décor each month. Seasonal Stand-Up Series:The Stand-Ups are done on 7 ct. Klostern using Perle Cotton #3, all sorts of fun specialty fibers and buttons and charms and stand 25” tall! We have Baxter the Bunny, Uncle Sam, Frankenstein, Nutcracker, Santa and Snowman. I have one by my fireplace and switch off with the others for seasonal decorations. They are really quite a conversation piece. Each one has the pocket watch that is a trademark on all of our Stand-Ups. They go so fast you can finish them in 35 hours. Children’s Series: We’ve added a Birth Sampler for little boys and a darling one for little girls. AJ the Airplane is flying high pulling a banner announcing the baby’s name and birth info. Perfect for all little boys rooms and goes great with the other boy designs-BJ the Bulldozer, CJ the car, TJ the train and Tow the tow truck. Malcolm the Moose: Malcolm is a curious Moose and he’s prone to mischief. He and his friends Mandy the Moose and Bernie the Bear bring stitching fun to all of us. There are over 40 designs to COLLECT. The cards are quick & easy to stitch, and buttons & charms add to the excitement. 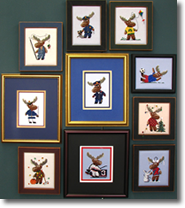 Our newest Malcolm designs are Army Moose, Marine Moose, Hockey Moose and Race Car Moose. Sorority Angels: These cute angels are holding the individual sorority's emblem. The dress is in the sorority colors with Greek letters. An alphabet is included to personalize with an initiation date, etc. Great gifts for rush. Kit includes chart, alphabet and 2 buttons. Cupcakes: Cupcakes are such the rage! 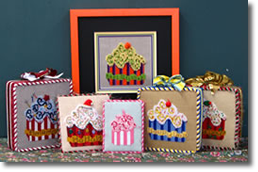 These designs are fun to stitch with a design for every holiday – Patriotic, Halloween, Christmas, Birthday, etc. All types of fun fibers and beads are used – the fiber we use for frosting even looks “fluffy”. 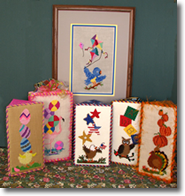 We’ve finished them as boxes and easels for easy storage so you can change your décor with the seasons.